I've lost count on how many times I've waxed poetic on this cozy as a your aunt's living room, hole-in-the-wall Filipino restaurant in Artesia. It has tables worn down by a thousand elbows; booth seats that have lost their bounce decades ago. But oh the food! There was the time I entitled my post on their sisig as "The Greatest Pork Dish in The World". And the many other instances where I just wrote about whatever I just happened to eat there the night before. Magic Wok isn't just my favorite Filipino restaurant; it is one of my favorite restaurants. Ever. The past two weekends I've dined there twice. And both times I ordered the Crispy Chicken and wondered why it has, until this point, escaped my attention. "Crispy" is understating it. This is chicken turned to edible gold. Look at the skin. It wants to come off in rigid, porous shards, slightly puffed from the fryer and as greaseless and light as a wafer. There's not a trace of batter, not a speck of breading used. It gets this way from nothing but mad cooking skills, the grace of God and a whole lot of oil. This is the same oil, by the way, that Magic Wok cooks its Crispy Pata and its Lechon Kawale in. Both, no doubt, melts a good amount of pork fat into the medium--an unintentional but not unwelcome contributor of flavor to the chicken. Submerged in it, the entire half bird transforms into an unreasonable object of desire. Nudge it and it falls apart like a house of cards. The meat, by the way, becomes kind of secondary to the skin. 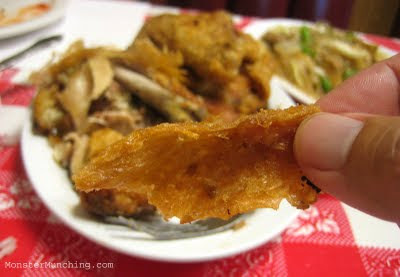 Any piece you eat without a scrap of the bronzed chick-chicharrón you'll want to dip the thimble of banana ketchup they give you; or better yet, the lechon liver sauce, which is not usually compulsory but should be. 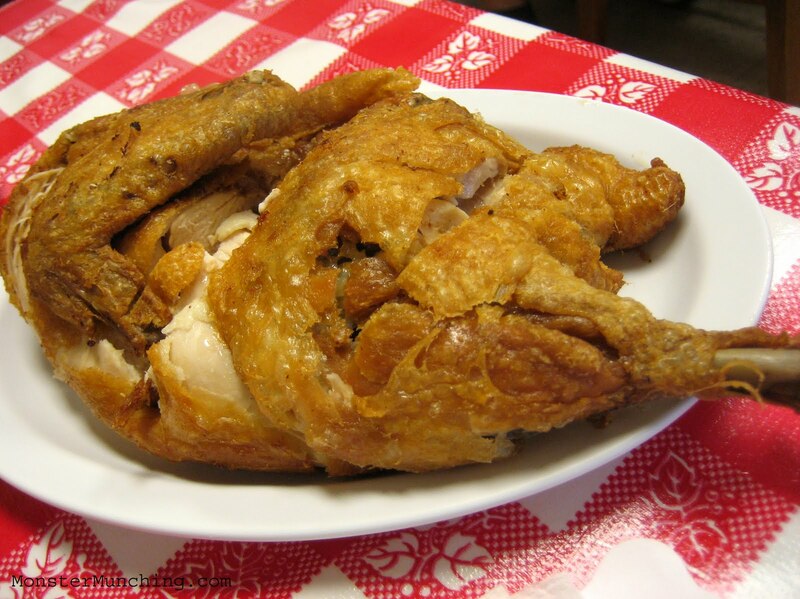 If you're trying to avoid the Lechon Kawale (deep fried pork belly) or the Crispy Pata (deep fried fatty pork leg) because of its cholesterol, this isn't the healthy alternative you're looking for. But by eating the dish instead of my usual Magic Wok pork staples, I'm currently under the delusion that I'm not contributing to my elevated LDL levels. Besides, I'm eating it with lots of bittermelon and vegetables from the ampalaya with egg and pinakbet, respectively. That should cancel out the effects of the chicken, right? Right? 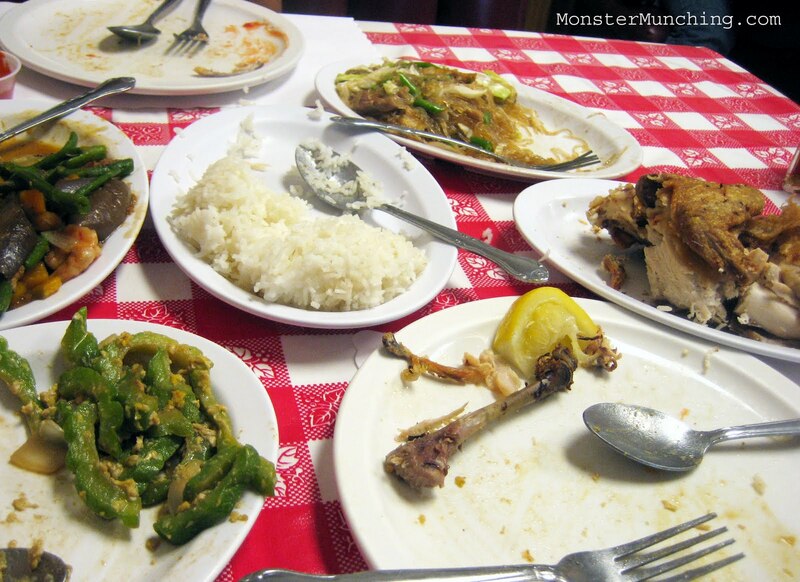 "Magic Wok isn't just my favorite Filipino restaurant; it is one of my favorite restaurants. Ever." Did I hack your blog and post this in my sleep last night? ....just shoot some pureed sisig from Magic Wok into my breathing tube, or put out a plate of Crispy Pata in front of a fan set on the highest speed. That top photo of the Crispy Chicken makes me want it. NOW. But I think they're closed on Mondays. Monster Munching readers, trust me, among the greatest joys in life is having a Magic Wok waitress set sisig, dinuguan, crispy pata, etc. on your table. Magic Wok is the bomb!! So glad you share my enthusiasm (and then some) on Magic Wok! They "borrowed" the name from the Chinese joint that came before, but man, is there a more apt adjective to describe what happens in that wok? Oh believe me, if I weren't afraid of dying, I'd have that sisig for breakfast, lunch, dinner and snacks in between!